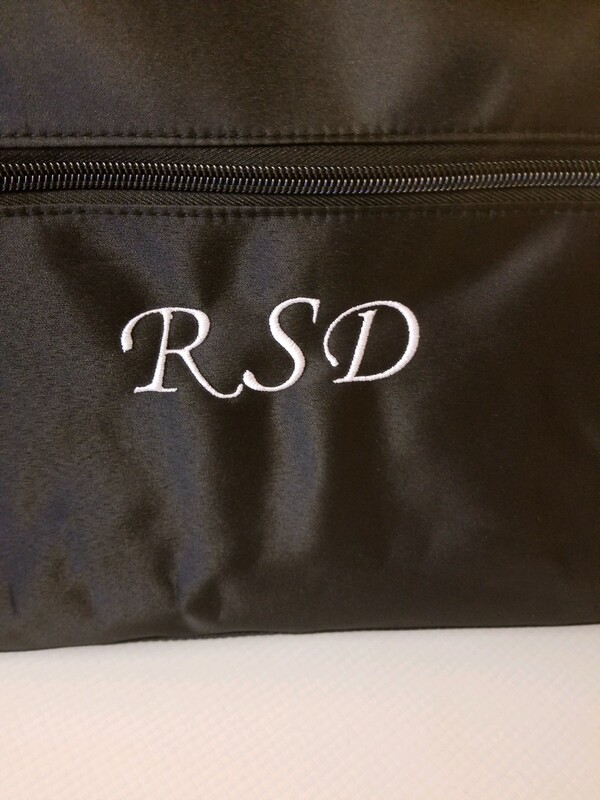 Perfect for a woman who is always on the go, this large black microfiber duffle conveniently transforms into a full garment bag and is personalized with a single initial or three-letter monogram. This airline approved carry-on bag also makes the perfect bag for trips to the gym before work or days with multiple engagements. Featuring 2 outer pockets and 3 inner pockets, including 2 shoe pockets, this garment bag has a place for everything she needs for business, formal, or casual dress. A detachable claw clasp secures the zippers and ensures the bag stays closed when full. This sleek convertible bag makes traveling in style easy. Garment Storage: When fully opened, the black microfiber garment bag measures 44 7/8 inches long by 35 3/4 inches wide and features a black and white pinstripe pattern. The center zippered liner opens for packing slacks, skirts, shirts, or dresses. A 34 inch long by 18 3/4 inch zippered pocket of the bag base provides ample space for undergarments, jewelry, makeup, etc. A sturdy black faux leather hanging loop provides a place to secure all clothing items on hangers. Pockets: Two shoe pockets measuring 8 1/4 inches long by 7 inches wide provide a nice, tidy place to store shoes without them coming into contact with packed clothes. In the closed, travel position, the bag outside features a 7 1/4 inch long by 8 inch wide zippered pocket on each end and a 13 inch wide by 7 inch deep zippered pocket on the front side for easy storage and access to items while on the road. Handles: Two 16 inch long black faux leather loop handles merge together at the center of the folded bag for easy lifting and transport. A removable 50 1/2 inch long by 1 1/2 inch wide black nylon shoulder strap securely latches to the bag ends for over-the-shoulder transport when walking long distances or with other items in-hand. Carry-On Ready: Once filled, fold the top and bottom liners over the center garment lining and secure Velcro tabs, fold the shoe compartments inward to an upright position and fold the top and bottom toward each other. Zip the two ends together to form a carry-on bag. I absolutely love this bag!! It is such a great idea, especially for a beach destination wedding! The only thing I wasn't happy about was how the letters on the bag turned out, it kind of looks like I didn't know my girl's initials. The middle letter is supposed to be the largest letter, but it is the same size as the other letters. If I would have known this then I would have just put them in order and not the last name as the larger number in the middle.